Everything looked perfect when the WS volunteers turned up at Chipstead Lake between 8am and 9am to get all the boats ready for what turned out to be a very busy day. The sun was plentiful and there was a nice breeze which ruffled the sails as we unfurled them and attached them to their booms. With this reasonable breeze coming from the N / NNW, Bob Marsh set a simple course with an initial Beat from the Start Line at Mark K to the windward Mark C – which had been dragged 50 yards into the lake to avoid the possibility of it being affected by any wind-shadow – and then a Reach across to Mark A, followed by a Run downwind back to complete the Course at Mark K. Also (ever thoughtful) Bob had set a Starboard Hand Marker between Marks A and K to keep boats out of an area of the lake where the weed has got thick and is not far below the water surface. So all was ready for the Race and a good-sized fleet of WS Racers, in 303s, Libertys, Martins and a 2.4, were on the water around 11am BUT……the wind had already started to show some signs of wanting to challenge the Racers!! The wind became very variable, both in direction (trying out all points of the compass!) and strength (from an acceptable 5 knots to absolutely zilch). So Bob and I went around the lake collecting a few boats to ensure that they would be close to the Start Line rather than bobbing about 500 yards away when the Race started. The start sequence ran smoothly and everybody, except Peter W, managed to start racing soon after their Start Whistle was blasted. Peter was clearly in a very generous mood and was being very cool, as he was going round in circles for 5 minutes, before starting!! 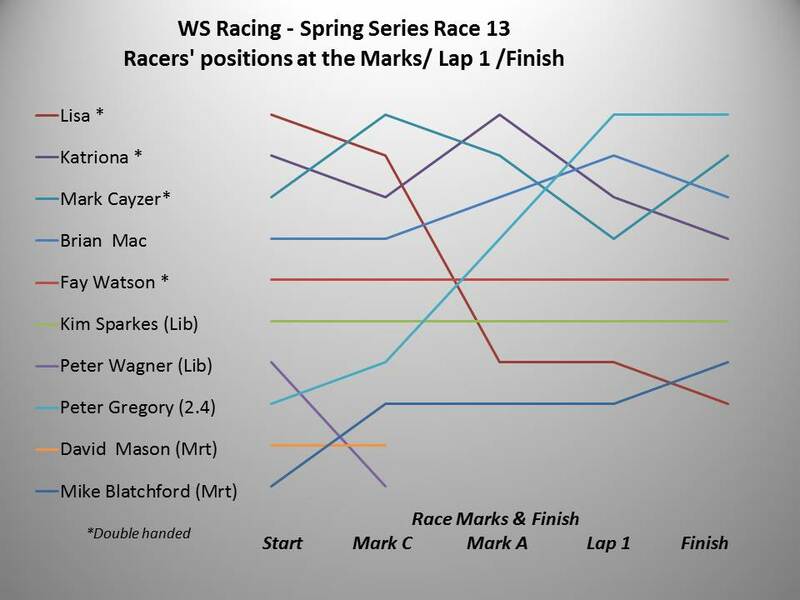 The schematic below shows how little wind blew during the Race (just over a solitary Lap was sailed). So….many many congratulations to all ten helms and four crews who managed to control any frustrations they may have had as a result of the wind gods deciding not to play with them! Sitting in the Race Boat, Bob and I could see how powerless most of you were, but whenever there was any puff of breeze, Peter Gregory’s red torpedo impressed as it got moving and accelerated up through the fleet and then away into a far distant lead – or at least 600 yards – by the time the race ended at 12.05! We determined the Race finishing order by going backwards down the fleet and hoping that none of you had managed to overtake before we got to you. Sometimes you find a really honest person who just refuses to accept a reward not due to them – and as I was having my lunch just such someone came and told me that they had interfered inadvertently with another boat during the race which had stopped that boat being in front of them when the Race Finish whistle blast sounded!! I was pleased to correct the official Race record!! I cannot conclude my report without mentioning the absence of Bob and Steve (probably still chasing after that Beast in the forest! ), however, it would not surprise me if Bob had a word or two to say about what happened out on the lake today. I thought I noticed a Spitfire – or maybe a Hurricane – buzzing around above us… was it an eye in the sky? Thanks for that explanation Bob. It would be very good to see you both back next week – sailing in rather more comfortable conditions than today, I hope! I do think that there is a minimum wind strength for Libertys to work. There is also a major design flaw in which you can’t back the jib with the pole on in light winds. I had mine very loose but it still failed to turn the boat towards starboard. The Wooden Spoon is ok if you wan’t to turn towards port every time, but it’s a very frustrating boat to handle! Apologies to you all and especially Bob. My daughter had a dental appt at Guys and asked if I could go along, so my paternal duties took over. I’m surprised at the lack of wind and it seemed breezy where we were, maybe it was because Bob wasn’t there! Congratulations to Peter G..again, can’t we put an anchor on his boat? Note for Peter W and all who normally sail the Libertys: I took Wooden Spoon out on Thursday afternoon and can confirm Peter’s experience that in very light winds the Liberty is difficult to tack. Wooden Spoon certainly has a set up (where/how I don’t know) that makes it far more difficult to tack to Port that to Starboard. Two points to note: 1. as with many dinghies, if you aren’t making any headway then you are going to find it difficult to tack; 2. when beating on a Port Tack, if the jib sheet is pulled in tight then you’ll find the tiller/joy stick has to be held fully over to the left to maintain your direction but you will probably still drift off line in leeward direction. In this case just relax the Jib a bit until you can sail along your chosen Tack with the Tiller just slightly held to the left. I had steering problems with the blue decked Liberty when I first started sailing it and asked Mike Coleman to test it. His comment to me was that the sail settings were quite critical and the helm would need to balance the sails with the Tiller to maintain a good course. So that’s the best advice I can offer at the moment on tacking. I do agree that the design and functioning of the Jib leaves a lot to be desired.